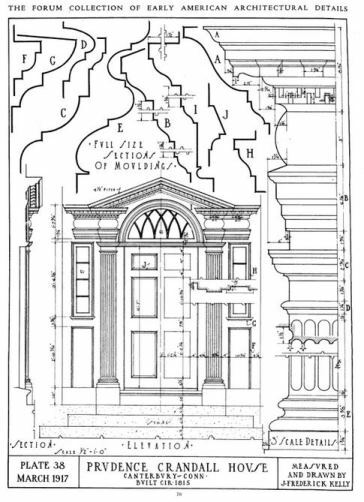 Early American Architectural Details, Plate 38, March 1917, Doorway of the Prudence Crandall House, Canterbury, Conn. Measured and Drawn by J. Frederick Kelly as illustrated in The Architectural Forum magazine, volume 26, 1917. J. Frederick Kelly was both a well-known architect and preservationist, as well as an architectural historian, whose works chronicled the intricacies found in many of Connecticut’s historical properties. Despite his expertise regarding Connecticut architecture, Kelly was born the son of a doctor in Lowville, New York, in 1888. The Kellys moved their family to Hamden, Connecticut, in 1900. Kelly began his architectural training at the Sorbonne in Paris, and continued his studies at Yale University, graduating in 1915. After graduation, he and his brother Henry Schraub Kelly formed the architectural firm Kelly & Kelly, located in New Haven. Among the buildings designed by their firm was the New Haven Museum on Whitney Avenue and the Yale School of Medicine. Additionally, Frederick served as the architect for the restoration of the all-stone Henry Whitfield House in Guilford and similarly restored the Denison Homestead near Mystic. On the same occasion, Kelly relayed an anecdote of the first colonists’ house in Connecticut, which he noted was actually transplanted piece by piece from nearby Massachusetts. According to Kelly’s account, “the first colonists’ house was at Matianuck, now Windsor, and it was brought by settlers who came from Massachusetts, because they knew of the existence of a fortified Dutch trading post at Hartford. They anticipated the hostility of the Dutch, and therefore they brought their ready to erect house.” In addition to his many articles and essays, Kelly’s more-well known publications included Early Domestic Architecture of Connecticut, Early Connecticut Meetinghouses, and Connecticut’s Old Houses: A Handbook and Guide. Warner House, Near Chester, Conn. Measured and Drawn by J. Frederick Kelly as illustrated in The Architectural Forum magazine, volume 33, 1920. Frederick Kelly died in 1947, when he was just 59 years old. Shortly after, officials unveiled a plaque at the historic Meeting House in Lebanon, in memory of Kelly and the original architect of the church, Col. John Trumbull. This particular instance of commemoration served as the ideal tale from which to understand the duality of Kelly’s professional abilities and subsequent legacy. Speaking of his late brother, Henry Schraub Kelly recalled that it was his deep personal interest in early Connecticut architecture and meticulous attention to detail that led to the restoration and preservation of the meetinghouse. When the hurricane of 1838 left the original structure in a deplorable state, Kelly referred to detailed blueprints he originally made of that structure and used them to restore it. Following Kelly’s death, a number of state agencies reprinted Kelly’s works outlining the history of the state’s various early architectural structures. One such organization was the Antiquarian & Landmarks Society of Connecticut who funded a re-release of the widely popular Connecticut’s Old Houses: A Handbook and Guide in 1963. “The Gilead Room.” The Hebron Historical Society, 2017. Link. “Harrison House Museum, Barn & Gardens.” Branford Historical Society, 2017. Link. “The Denison Homestead,” 2017. Link. “Finding Aid to the Henry Whitfield House Inventory of Records, 1768-1957.” Connecticut State Library, 2016. Link. “J. Frederick Kelly: MSS 270 - Alphabetical Index of Manuscript Collections.” New Haven Museum, 2017. Link. Kelly, J. Frederick. Connecticut’s Old Houses; a Handbook and a Guide. Stonington, CT: Antiquarian & Landmarks Society, 1960. Kelly, J. Frederick, and Committee on Historical Publications Tercentenary Commission of the State of Connecticut. 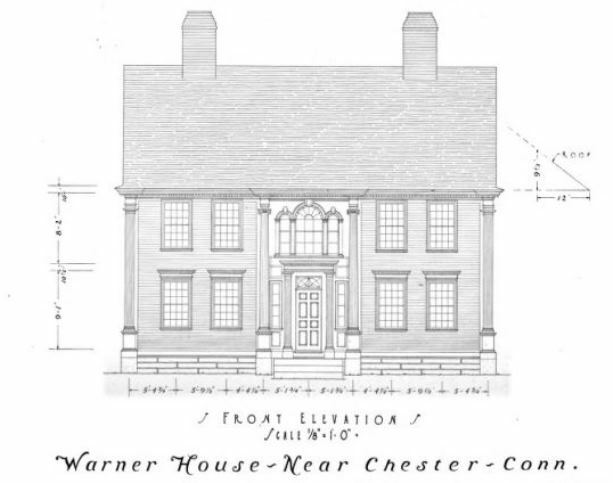 Early Domestic Architecture of Connecticut. Connecticut: The Tercentenary Commission, 1933. Link. Kelly, J. Frederick. 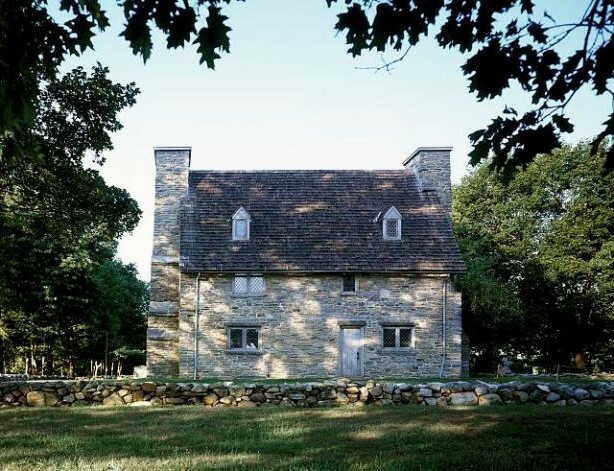 The Henry Whitfield House, 1639: The Journal of the Restoration of “The Old Stone House,” Guilford. Connecticut: J. Frederick Kelly, 1939. Link.